We are excited to announce our newest launch, Shoreline OBX. InterCoastal Net Designs has been working with the folks at Shoreline OBX since 2009, but we’ve recently completely redone their website to bring a more modern presence to their online appearance. The new website is responsive, allowing mobile and tablet users alike to browse the website with ease. The site is fully integrated with Escapia property management software, featuring a brand new booking engine integration. Along with website development, Shoreline OBX works with ICND monthly for Search Engine Optimization, Pay Per Click Advertising and Email Marketing. 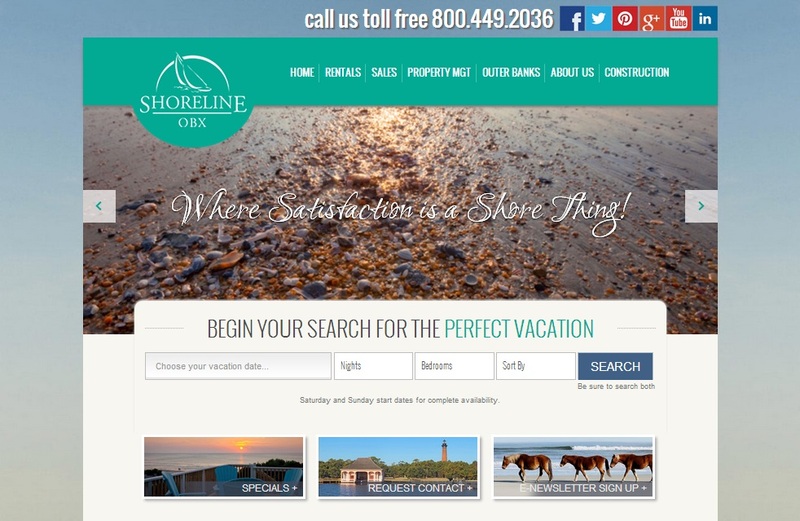 The previous Shoreline OBX website did not include a sales section. However, we completed an MLS integration for the new website, allowing website visitors to search both vacation rental and real estate listings. We hope this will facilitate an easy user experience for those interested in either options! We want to thank Shoreline OBX for their continued business with ICND. We are excited to continue to grow their online presence through innovative ideas and a strong online marketing game plan. Please visit their website! As always – contact us if you’re interested in learning more about our vacation rental and real estate website design and unique functionality!